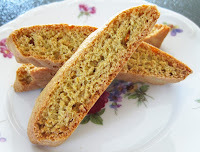 Per the recipe, authentic biscotti are low in fat and easy to make (which these were). To achieve the characteristic crisp texture, they are "twice-cooked," first as a log, then again as slices. 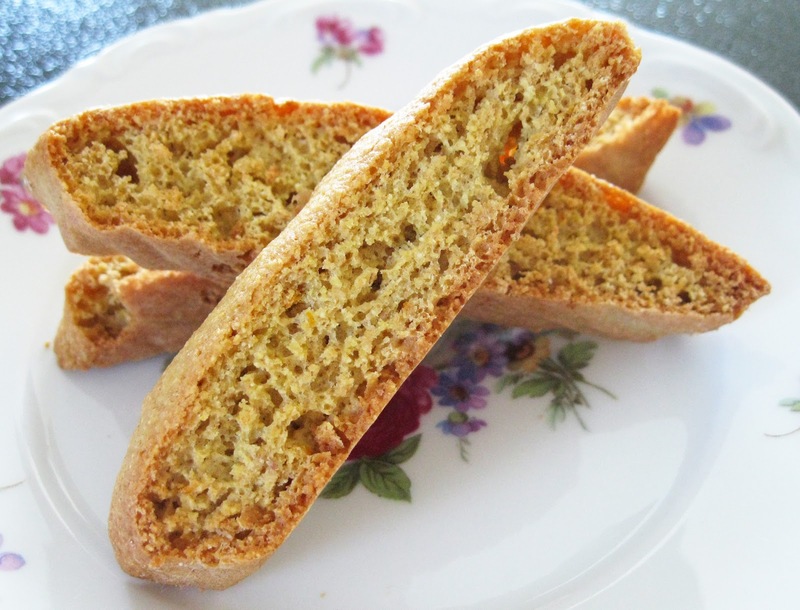 And as with any biscotti, these fragrant spiced ones are great dipped in a steaming cup of coffee or tea. 1. Preheat oven 325ºF. Line a baking sheet with parchment paper or a silicone baking mat. 2. Whisk whole-wheat flour, all-purpose flour, sugar (or Splenda), cornmeal, ginger, baking powder, baking soda and salt in a medium bowl. Whisk eggs, egg whites, orange zest and orange juice in a large bowl until blended. Stir in the dry ingredients with a wooden spoon until just combined. 3. Divide the dough in half. With dampened hands, form each piece into a 14 x 1-1/2 inch log. Place the logs side by side on the prepared baking sheet. 4. Bake until firm, 20 to 25 minutes. Cool on the pan on a wire rack. Reduce oven temperature to 300º. 5. Slice the logs on the diagonal into cookies 1/2 inch thick. Arrange, cut-side down, on 2 ungreased baking sheets. Bake until golden brown and crisp, 15 to 20 minutes. (Rotate the baking sheets if necessary to ensure even browning.) Transfer the biscotti to a wire rack to cool. Well, me in my not uncommon style of skipping sections within a recipe, completely missed the part where after the first baking you're suppose to cool them, reduce the heat and THEN do the second baking. Well, after the 25 minutes was up, took them out, proceeded to cut them and back into the oven at the same temp. Oh yeah, brilliance. It wasn't until I was checking the recipe toward the end of the second baking I found my "oops." Quite honestly, these turned out great even with my "oops." I do wonder though if cutting after the logs had cooled would have resulted in more crumbs and possible breaks, which I had neither of. So now you know, at least with this recipe it is very forgiving of baker's oops. As for shaping the logs, this dough is not stiff at all which explains why you have to wet your hands first before shaping. I kept trying to get the two logs to only be 1-1/2 inches in width to no avail. They just kept wanting to spread out. So as soon as I could get them to stay at about 2" in width, I quickly put the sheet into the oven. They do spread out while baking, so make sure that you allow enough room between the two. *After a few hours, I did notice that the biscotti really weren't light and crispy throughout. So I did put them back in the oven @ 300ºF for 15-20 minutes. Definitely made a difference. Light and crisp throughout.